Time Warp, safe Botox in a bottle, High Intensity Serum by Saint Germain Cosmetics. The regenerating and reparative skin care formulas created by Troika Saint Germain are among the most expertly crafted in the industry. Not only brilliantly formulated, they are energetically balanced to be gentle, nurturing, and visibly rejuvenating. I highly recommend them on their own and as part of a comprehensive rejuvenation program. Time Warp rejuvenates skin with immediate, visible, lasting results. It helps reduce lines and wrinkles, tightens and lifts the skin, and relaxes facial muscle tension. It is particularly effective in tightening the difficult neck area and in reducing puffy eye bags. Our satisfied customers also report that Time Warp helps eliminate age spots and acne scars, smoothes "crepey" skin, shrinks and refines pores, produces a more even skin tone, and helps heal sun-damaged skin. In many cases, results have been observed with the first application. Repeat purchase demand is very high. Time Warp contains more effective ingredients than any other "Botox-in-a-bottle" type of product. Most importantly, Time Warp contains these leading-edge ingredients: Acetyl Hexapeptide-3, Palmitoyl Oligopeptide (the active ingredient of Matrixyl without its toxic fillers), and Saccharomyces/Copper Ferment, along with our proprietary blend of 21 botanicals and Chinese medicinal herbs, that heal, tighten and firm skin while restoring the texture and elasticity to a youthful state. Additional ingredients of note are: Hyaluronic Acid, Rose Canina Oil, Green Tea, Marine Enzymes, Evening Primrose Oil, Red Algae Extracts, Co-Q10, and Retinyl Palmitate. 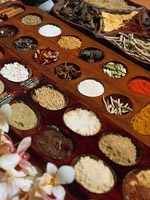 All oils, herbs, and flowers used are organic. Time Warp is completely safe unlike Botox. Botox is a toxic poison that starts losing its effectiveness as soon as it is injected. Botox needs to be re-injected every 3-6 months, costing hundreds of dollars for each painful injection. Botox has a high risk for dangerous side effects. Time Warp contains no plastic! Many "Botox-in-a-bottle" type of products contain plastic as the main ingredient that tightens the skin, which also clogs pores and prevents proper breathing. The tightening effect lasts only until the face is washed. Time Warp has a beneficial and cumulative effect. Your skin improves with each application as you turn back the hands of time. 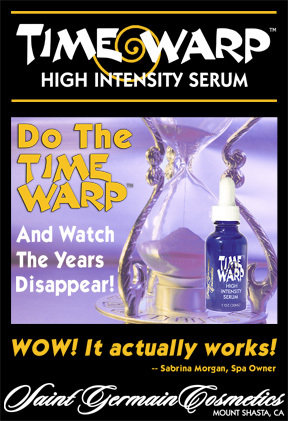 Time Warp is a highly concentrated serum. Only a few drops need be applied to cover the entire face & neck. One bottle will last 2 months or more making it extremely economical. Time Warp may be used alone but works even better in tandem with its companion product, TransformEssence Skin Nutrition Cream. It is suitable for both men and women. Time Warp™ is available in a 1-oz cobalt blue glass bottle. To Order by Phone: Please call 530-926-0770.